Cortez Electronics Buyers San Diego. Sell iPhone, sell laptop, sell computer, sell android, sell galaxy note, sell samsung galaxy phone, sell stereo system. Are you looking to sell electronics in San Diego? It’s Simple to Sell Electronics in San Diego to us. PLEASE NOTE FOR ALL LAPTOPS WE LOOK FOR THE ITEM TO BE 6 MONTHS OLD OR NEWER. FOR ALL DESKTOPS WE LOOK FOR ITEMS 1 YEAR OLD OR NEWER. THE REASON FOR THIS IS BECAUSE TECHNOLOGY UPGRADES VERY QUICKLY AND OLDER MODELS GET OUTDATED FAST. WE ALSO LOOK FOR NEWER SMART TVS (1 YEAR OLD OR NEWER). 1. Come to our store located at 255 3rd Ave, Chula Vista CA 91910 (we are in Downtown Chula Vista, 10 minutes from Downtown San Diego with Trolly & Bus lanes nearby). Grab that cell phone, tablet, iPad, bring it down to us. Our friendly associates will evaluate your device, then give you cash on the spot! Selling iphone in San Diego? Sell your iphone to us and get cash for iphone in San Diego on the spot. Selling ipad in San Diego? Sell ipad to us and receive cash for ipad in San Diego. Selling phone in San Diego? Sell phone to us and receive cash for phone in San Diego. Are you looking to sell computer in Chula Vista CA 91910 or sell iphone in Chula Vista or sell laptop in Chula Vista? 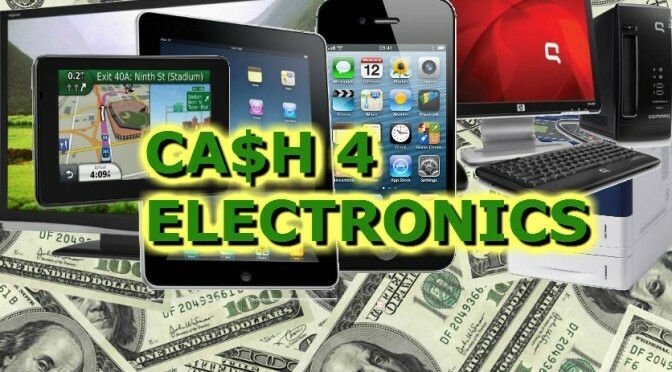 We have a cash for electronics store in Chula Vista near you where you can sell laptops, sell ipads, sell iphones, sell android phones, sell samsung galaxy phones and sell electronics. We have electronics buyers locations in Downtown San Diego, Downtown Chula Vista, Balboa Avenue San Diego and La Jolla CA. We Buy Samsung Galaxy phones, iPhone laptop computers desktop computers, certified baseball cards, certified football cards, certified basketball cards, flatscreen smart TVs, Nakamichi stereo systems, Nikon SLR cameras, Canon SLR Cameras, Nikon Lenses, Cannon Lenses, & Digital Cameras. If you are looking for electronic buyers in San Diego call us today at (619)270-1132 or click here to contact us.